1991 Russian Crash and Retrieval, "Grave of the Devil"
In recent history, reports of UFO sightings came primarily from the United States and Great Britain. Ufologists and other interested individuals knew that a world of information was kept behind a Communist curtain of secrecy. The Russian military, the KGB, and the Russian government kept a tight lid on all information, including any UFO or paranormal activity. Thanks to Glasnost, that has changed. Now information is coming from the former Soviet countries, as UFO researchers and scientists are relating information through the Internet, and organizations like MUFON. Fortunately, the Russians have always taken a more serious approach to the enigma of UFOs. In America, at least until recently, most individuals who saw something strange were afraid to come forward with the information. This "little green men" mentality does not exist in Russian reports. For that reason, we are graced with an excellent report of a crashed saucer. 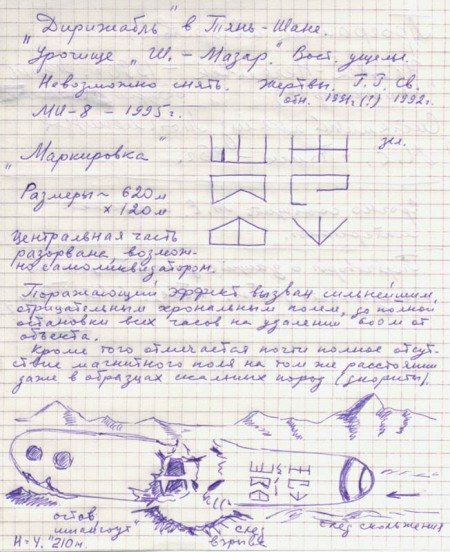 Ufologists Nikolay Subbotin and Emil Backurin's labors bring us this compelling account of a crash in the "Shaitan Mazar," Russian for "Grave of the Devil." The Shaitan Mazar is located in the Tien Shan Mountains of Kyrgyzstan near the border of China. The incident of Shaitan Mazar began on August 28, 1991, at shortly before 5:00 P.M. An extremely large object approximately 600 meters long, and 110 meters in diameter appeared over the Caspian Sea, showing on radar screens of the tracking station on the Mangyshlak peninsula. Radar computations showed the object moving at the speed of 6,300 miles per hour, at an altitude of 21,000 feet. Tracking station operators immediately broadcast the "friend or foe" request. No response was received. The streaking craft was now considered an "intruder." The cosmodrome at nearby Kapustin Yar was contacted, requesting information on any test flights from the facility. The officer in charge replied that there were no test flights of any type, and that he, also, had the object on his radar screen. Operators at Mangyshlak issued a military alert. The alert put the military into action immediately. Two MIG 29 fighters were diverted from a routine mission, and two others were scrambled from the peninsula. The pilots were ordered to attempt to force the craft to land, and if those orders were refused, to shoot it down! Military flight commanders gave interception coordinates to the planes. They would meet with the unknown object over the Aral Sea. Speeding to the position, the MIGs had the object on their radar screens. When they reached visual range, they were shocked to see a gigantic, elongated, metallic gray object. The flight leader requested the "friend of foe" response, and gave orders for the unknown craft to fall in behind the lead MIG, and follow it to a landing. There was no response from the craft. Also, the UFO seemed unconcerned with the MIGs, which now surrounded it. The MIGs had assumed a position of 800 meters from the unknown craft. As the MIGs closed in on the craft, the pilots noticed two port holes toward the front of the object, and green symbols composed of a language unknown to any of the Russian pilots. Oleg Murashev, Nelli Slugina, Anton Bogatov, Nikolay Subbotin, Alexey Kostenko, Emil Bachurin. Photo by Maxim Slugin., Copyright by Nikolay Subbotin © and Russian UFO Research Station ©, 1998. As the MIG jets kept pace with the object, they radioed the status of their search to area defense headquarters. An emergency meeting was called to make a decision on the course of action. Should they give the order to shoot the craft down? This could blast it out of the sky, and minimize the amount of information to be gleaned about its origin and mission. High ranking officers decided to fire warning shots across its flight path, forcing it to follow the MIGs to a safe landing. "Close in from either side." "Fly parallel to the target and fire warning shots in its path," was the exact order given to the MIG leader. The planes immediately responded by closing from 800 to 500 meters. They were ready to fire their weapons. As the pilots squeezed their triggers there was no response from their controls! None of the electrical system worked. The cockpit controls were dead, and then the engines began to sputter. The object began to pull away from the MIGs. The planes were now unoperational. Their condition was radioed to headquarters, and they were ordered to nurse their planes back to base, and abandon the hunt for the intruding UFO. Radars on the ground continued to track the object, as it made a zigzag course back over the Aral Sea. Mathematical computations assigned the craft's speed at an astonishing 42,000 miles per hour as it again assumed civilian air space. As the object left the MIGs, the controls on the jets began to return, enabling them to make a safe landing. Flight controllers at Mangyshlak made notification to air force and civilian personnel of the object's projected flight path. They were told that an unidentified craft was traveling through their area, posing a serious threat of collision with other craft. Approximately 45 minutes after the sudden appearance of the UFO, it simply vanished from radar screens. Though shaken from the stirring events of the last three-quarters of an hour, there was a sense of relief among military personnel that whatever or whoever had invaded their airspace and crippled their jets, had left them. This was the end of the giant UFO, or was it? Although the strange and unusual events of August 28, 1991, brought numerous debriefings and discussion, the threat of the UFO was now passed. What was the enormous craft that had invaded civilian airspace? What was its origin? What was its mission? Was the threat from another country? or another galaxy? These questions were tossed about for a month with only conjecture and speculation offered for an answer. The search for the UFO would now take a dramatic turn. By the end of September, rumors began to be spread about a large object which had crashed into the mountains of Shaitan Mazar. Residents of the villages around Karakol were witnesses to an object of immense size that had met its fate deep in the mountains to their east, in a rocky gorge called "The Grave of the Devil," near the Sary Dzhaz River. These stories became so prevalent, that an expedition was formed to make a dangerous trek up into the deep mountain forests to find this strange craft. Was the story of the villagers real? The expedition was now ready to answer that question. 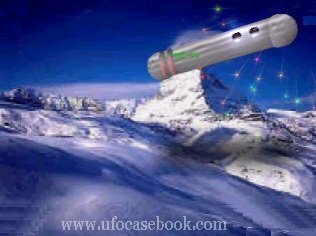 The group of brave men and women who formed this expedition was made up of experienced mountain climbers, locals who knew the danger of the mountains and woods, and members of the Russian UFO group, SAKKUFON. The leader of this UFO group was the well respected researcher Anton Bogatov, who would also lead the fact finding expedition. Hopes were high that this group could locate the crash site and answer many compelling questions about the large craft. Would they be successful, or would they merely find a meteor, or perhaps a piece of asteroid? The locals, who were descendants of the Mongol race would actually lead the way to the crash site, which would take them through the dangerous snow-covered Tien Shan Mountains. Following sighting reports and rumors, the group traveled for two weeks through the mountains. They could not find any sign of a crash. Deciding that the crash must have occurred at the other end of the Sary Dzhaz River valley, they journeyed there. Rumors also began to spread by messengers to the group that several of the locals had actually found the crash site, but were burned, and their watches malfunctioned. This put an evil stigma on the crash site to the locals, but it was just the kind of news that would urge the group on to find the now forbidden site. The heavy snows of the Tien Shans ominously warned of an avalanche, and almost certain death. The group forged on for two more weeks, but without success. Finally, with members suffering frostbite and exposure, the members turned back to their base camp at Bishek. There they rested before returning to their respective homes. The mission had failed. Would this be the last of the expedition? or would the persistent rumors of the crash continue to urge others to return to the Tien Shans to look for the UFO? The upper echelon of Russian government had become very interested in the rumors of the crashed site. The sudden disappearance of the UFO from radar screens only a few months earlier still held their attention. Was the crashed flying object and the object over the Aral one and the same? A proud people, the Russians were not want to be embarrassed. They became even more determined to get to the bottom of the mystery. Dramatic new information was forthcoming. SAKKUFON received a report that the Russian Air Force had found the crash site in November 1991! While attempting to hoist part of the object from a snow-covered bank, the helicopter had crashed, killing all aboard. Russian winter was at hand, and the Air Force stated that no further attempts of retrieving the craft were planned until spring. This could be it! This new information was the catalyst needed to put new life and determination into the UFO research group. They would plan another land trip, but they must beat the government to the site, or the findings would forever be hidden from public knowledge.